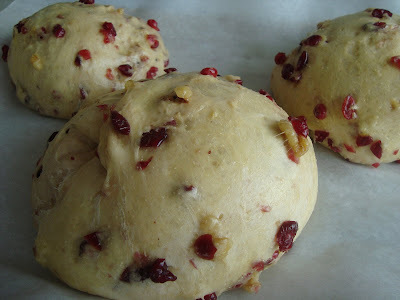 I'm playing catch up with my Bread Baker's Apprentice Challenge and made Peter Reinhart's recipe for Cranberry Walnut Celebration Bread (which you can get from his book above, starting on page 154-156.) 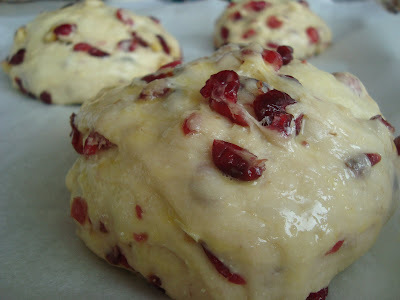 This was a wonderfully lemon-scented bread studded with cranberries and walnut. I loved how beautiful they came out and really enjoyed the ease in making them too! 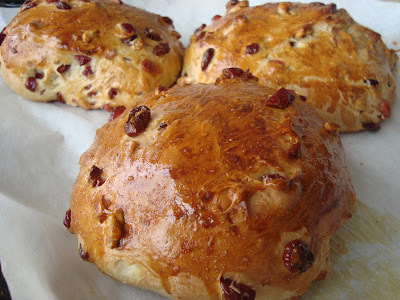 The dough for this bread is made with flour, yeast, salt and sugar... followed by butter, lemon extract, eggs, and milk. 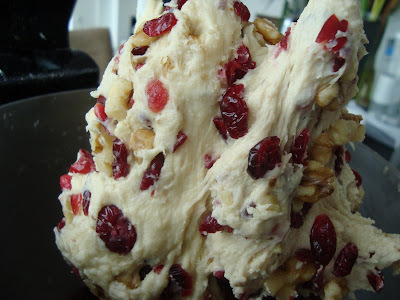 Once these ingredients are combined, cranberries and walnuts are introduced while it kneads. After kneading, the dough can be formed into a double decker braid, three braid, batard or boule. Since I plan on giving this bread as gifts, I decided to make three small boules with the dough. These boules were brushed with an eggwash and left to rise. When the boules finished their first rise, I brushed them once again with eggwash before baking until golden brown. I love how colorful these are with the cranberries mixed in! I am working on this bread today! I think I will also shpae into something appropriate for gifts. It looks delish! I hopefully will feel caught up after this recipe. Thanks for sharing. Happy Baking! Beautiful Rolls. Maybe next time I make this bread I'll go this route as it will be easier to spread Nutella on them! There's those individual servings again! I really do wish I'd have thought of that. BTW... you've been baking your brains out woman! LOVE the boules! They're beautiful- what a great idea. I might have to try this the next time I make this bread. Beautiful little boules. They look so sweet. i will make mini ones next time.